A stallion entered the ring, his neck arched and his ears pricked, a bay coat that sparkled against the sun. Asayel Raheeb was just ready to wow the judges, without question. The four years old stallion not only achieved the highest score of the senior stallions but was also the unanimous choice of the judges for Egyptian Event Kuwait Gold Champion Senior Stallion, much to the delight of his proud owner Mohammed B. Khuraibet. Bred by Asayel Stud, Asayel Raheeb combines broodmares supreme in his pedigree. Sired by Naseem Al Nakeeb, Asayel Raheeb has eleven lines to famous Hanan. The dam, F Shubani Bint Al Lahab, is a daughter of World Champion Stallion Al Lahab, himself a son of influential The Vision HG. The maternal granddam F Shakirah offers a line to excellent producer Maysouna through her fine son Maysoun. Finally, in tale female line traces back to worldwide influential Rodania through Bint Riyala – Malaka – Nazeera. Kuwait gained a special reputation as Straight Egyptian Arabian stronghold. No wonder, an Egyptian Event was established and was held for the third time in 2017, organized by Abdullah Albraihi and his team of Bait Al Arab, Kuwait’s state stud. The country has been fortunate to stand some top stallions over the past decades but any has ever left greater memories than Ansata Hejazi, who sired brilliant and beautiful sons and daughters likewise. Ansata Hejazi’s influence can still be felt in Kuwait. Silver and Bronze winners M Anan and Gazwan Al Rayah are grandsons of the unforgettable Ansata Hejazi. Several excellent colts from Dubai Arabian Horse Stud, UAE, proudly owned by Kuwaiti farms, dominated the junior classes. 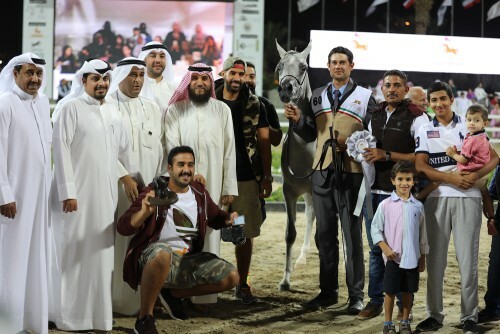 With 93,21 points, D Monaf achieved not only the high score of all colts and stallion but also garnered the Gold Champion Junior Colts, owned by Ali Matar Al Wawan. D Monaf is a son by World Platinum Stallion Royal Colours out of D A Aniqah, by Shaikh Al Kuran, and traces back to the Dahman Shahwan line of Nadra El Saghira. Silver went to D Monaf’s full brother, D Raouf, owned by Al Babtain Stud, and the Ezz Ezzain son Ajayed Qaisar achieved Bronze. It was all change, too, in the championships and SH Fares was the lucky winner. Sired by Basil Al Farida, SH Fares was second in the yearling colts section b, bested only by Soor Al Ward. In the championships, SH Fares was able to show himself at his best and was awarded the Gold Champion Yearling Colt. What a wonderful moment for his proud breeder and owner Rashed Ahmad Al Shaya. The Dahees Al Rayyan son Soor Al Ward was awarded Silver with Dahey Najd garnering Bronze. Three amazing yearling filly classes came in front of the team of international judges: Annette Dixon, Josy Everars, Joanne Lowe, Dr. Manfred Neubacher, Burchard Schroeder and Sylvie Eberhardt. 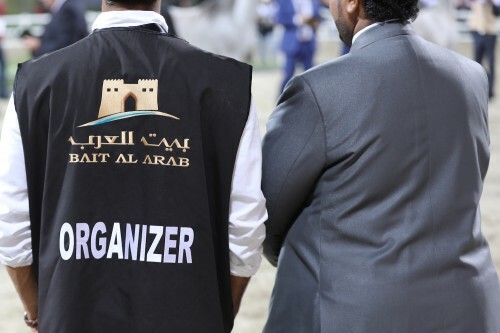 Again the high score winner achieved the title: Gold Champion Yearling Filly was awarded to Riyanat Al Maale, bred by Al Maale Arabians and owned by Khaled Ayed Jassim Al Enezi. Riyanat Al Maale is by NK Nabhan out of Radhwaa Ezzain; with 31 crosses he is heavily inbred to aforementioned Hanan. However, in tail female line Riyanat Al Maale traces back through Ansata Rosetta and Ansata Ghazala to another exceptional broodmare, Ansata Bint Bukra. Ansata Bint Bukra’s influential can also be seen in the pedigree of Silver winning Zainah Al Nawasi, by Asfoor Al Waab. Bronze-winning filly Malak Al Konooz is by Ansata Almurtajiz, so again influenced by Ansata Bint Bukra through Ansata Hejazi and Ansata Bint Misr. But in tail female line, Malak Al Konooz traces back through Bint Moufisa to immortal Moniet El Nefous. The Gazal Al Rayah daughter SH Ibtihal, bred and owned by Rashed Ahmad Al Shaya, won his class with fantastic 91,43 points, the high score of all fillies. The two years old SH Ibtihal combines the influence s of Ansata Hejazi with Al Adeed Al Shaqab and Alidaar and traces back through Madinah to Moniet El Nefous. However, in the championships Nijmat Asslan, winner of the three years old fillies, finally beat her. The Gold winning Ansata Almurtajiz daughter Nijmat Asslan is bred and owned by Ehssan Asslan and represents the Bint El Bahreyn family through Naeema – Tifla. Silver was garnered by Zahwah Al Qadisiya, by Mabrook Al Mohammadia, and SH Ibtihal received Bronze. The Gold Champion Senior Mare and the high score of all mares and fillies was Anqaa Aljazira, bred by Talal Al Mehri and proudly owned by Barrak Yaqoub Al Hajeri. Anqaa Aljazira is by Ezz AlJazira, who combines the blood of Ansata Bint Bukra with Hanan. On the female side of the pedigree, Ansata Bint Bukra can also be found through Ansata Selman and Ansata Halim Shah. But Anqaa Aljazira is out of Mai Aljazira, herself a daughter of El Thay Mameluk (by Ibn Nazeema out of El Thay Mansoura). This magnificent chestnut stallion was brought in advanced age as a kind of outcross to Kuwait – and Anqaa Aljazira is a wonderful example how well that worked out. The Ezz Ezzain daughter Al Kahara Asayel accomplished Silver and Prevues Rose RCA, a Thee Desperado daughter, garnered Bronze. We wish to thank the state stud Bait Al Arab for hosting the 2017 Egyptian Event Kuwait and for partnering with Arabian Horse Results.